The smart way to sell through social media. Today’s market is a challenging one. Ensure you utilise one of the most engaging, cost-effective, user-focused marketing solutions available. Stand out from the crowd with Facebook Automotive Inventory Ads, and use the power of one of the world’s most popular social media platforms to match your stock to millions of prospective buyers. Why should you be using Facebook Automotive Inventory Ads? Social media plays a pivotal role in any prospective vehicle buyer’s online journey. And Facebook has more impact than any other. Facebook is a global platform accessed by millions of potential buyers every day. That’s why world-renowned brand names use it to build their business. Facebook helps level the playing field, by providing you with the same tools and services as everyone else. 91% of car buyers† start their car buying journey online. Even in the showroom, 49% of buyers use their smartphone to conduct research†. Mobile dominates the digital buying journey, and you need to ensure you are visible to buyers at multiple touchpoints throughout. Facebook Automotive Inventory Ads enable you to reach regional users at all stages along the purchase path, giving your stock and brand digital prominence. They also deliver excellent ROI, saving you money, time and effort too. From building awareness for your business, to guiding in-market buyers directly to your website, we will ensure you’re able to create demand and maximise your stock’s potential on the world’s largest social media platform. With intelligent user-tracking and our NetDirector® Stock software, we make sure your ads are always in front of the right audience. 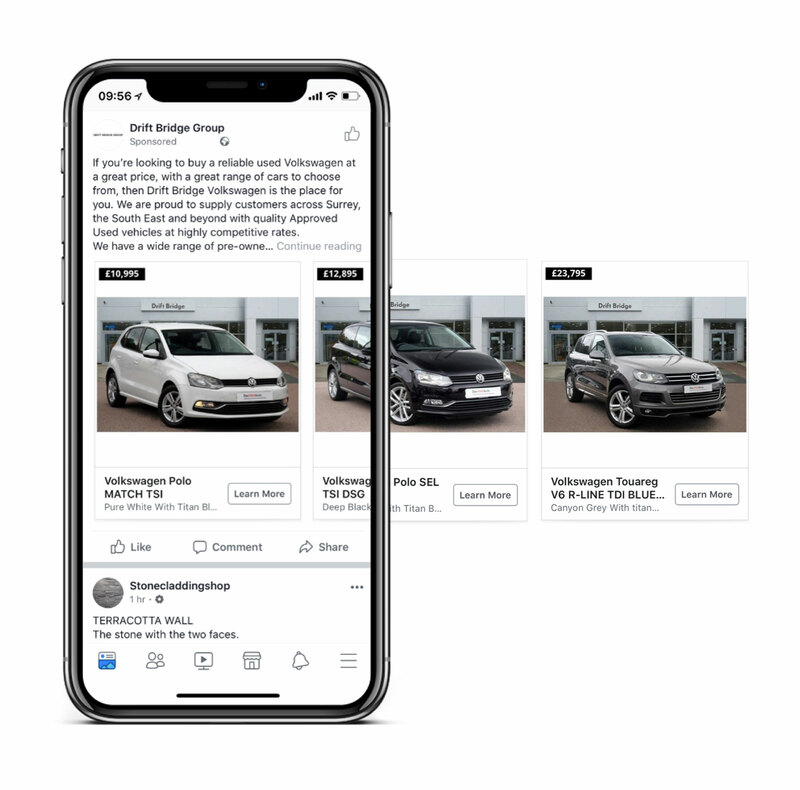 These ads are then shown to users via their Facebook newsfeed, promoting your available stock directly to those who have expressed an interest online, or exhibited behaviours suggesting they are in-market for a newer vehicle. Using key information from NetDirector® Stock, simple, mobile-optimised ad units are automatically created featuring imagery and data such as make, model and price, alongside bespoke copy. We then target Facebook users whose on-site behaviour and intent indicates they are likely to be interested in your vehicles, products, and services. We’ll help you automatically create compelling, vehicle specific ads for Facebook from your stock. It’s a complete, end-to-end advertising solution for vehicle retailers of any size or discipline. “Over a two month period of being live with Facebook Automotive Inventory Ads, we received 89 completed enquiry forms. The ads delivered an average cost of just £5.53 per lead as a result. In addition, the campaign also generated 43 web enquiries, equating to an overall Cost Per Lead of £7.44. Alongside this, the catalogue sales campaign we are running has so far generated over 9,499 used car detail views, which results in a cost of only £0.05 per view. The impressive efficiency of the campaign, and the real-world value it delivered to our business means we are very happy with the results." Reach more people in less time: instantly generate personalised ad experiences for each vehicle and every site visitor, without having to configure and manage each one individually. Keep things relevant: automatically promote relevant vehicles from your inventory, only showing users and potential customers the stock they’re interested in. Advertising that’s always on: setup and configure your campaigns once, and ensure your brand and stock remain consistent and front-of-mind, attracting potential buyers more likely to convert. Adaptable, cross-device advertising: deliver ‘right product, right person’ ads across Facebook, no matter which devices potential customers are using – mobile, tablet, laptop or desktop. Cost-effective: minimise wastage and focus solely on vehicles or franchise brands that need a marketing boost, only paying when the user has either clicked to your website or completed a lead form enquiry. Trackable: easily track web enquiries and phone leads, and gain insights in to which audience targeting and ads sets drive positive ROI. Optimal user journey: streamline the online user journey by allowing users to make an enquiry without leaving Facebook. NetDirector® is a registered trademark of G-Forces Web Management Ltd.
GForces Web Management ltd is an Appointed Representative of Automotive Compliance Ltd, which is authorised and regulated by the Financial Conduct Authority (FCA No 497010). Automotive Compliance Ltd’s permissions as a Principal Firm allows GForces Web Management ltd to act as a credit broker, not as a lender, for the introduction to a limited number of finance providers only.